Live Video of LA shooting; 50 Dead & 100 injured Sensitive content! The gunman in the mass shooting on the Las Vegas Strip has been identified as 64-year-old Stephen Paddock, Las Vegas Sheriff Joseph Lombardo said Monday morning. The Sheriff has also said authorities believe they have found the woman who was travelling with the suspect. MGM Resorts, which owns the Mandalay Bay toward the Route 91 Harvest festival, where the incident took place. At least 50 people were killed and more than 200 were injured in a shooting on the Las Vegas Strip on Sunday night, police said Monday morning. Police said the suspect has been identified. Police are searching for a woman named Marilou Danley who was traveling with the suspect, Lombardo said. He described Danley as an Asian woman, 4 ft 11 inches tall and 111 pounds. Two Las Vegas police officers are being treated at a local hospital for injuries they sustained during the shooting, Lombardo said. One is in critical condition and the other sustained minor injuries. In addition, the sheriff stated that there were off-duty officers attending the concert who may have died. The identities of the officers involved have not been released. The state of Las Vegas is Nevada, has some of the most relaxed gun laws in the United States. It is legal to carry an assault rifle and there is no magazine capacity limit. Citizens can purchase as many rounds of ammunition as needed and are not required to carry permits and blue cards. 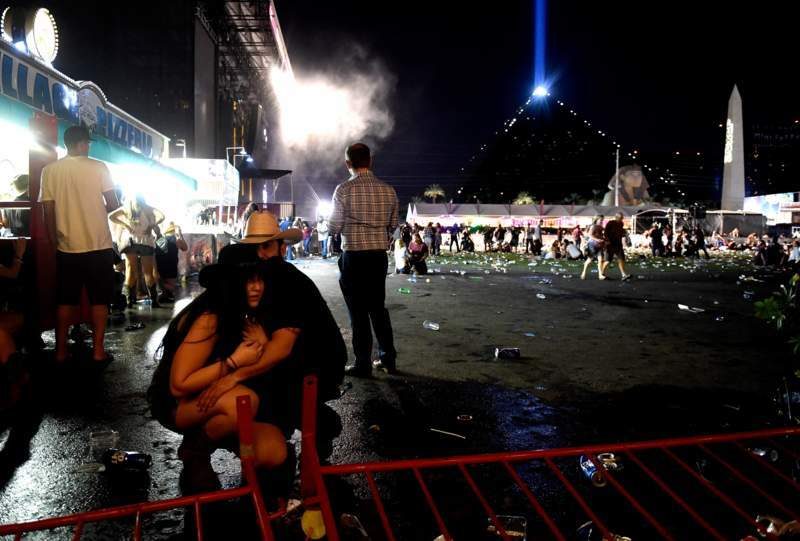 There is no waiting period mandated for firearm purchases and private gun sales are OK.
A police officer has told reporters that although he knows people want to help, they should stay away from the Las Vegas Strip and Mandalay Bay until police are sure it is safe. The videos from social media have sensitive content and anyone with a sensitive disposition should watch them with caution. Please click on the links to play them.